The pulmonary and thoracic section of anatomic pathology provides diagnostic support to the clinical teams involved in the diagnosis and treatment of lung, pleural and other thoracic disorders at UNMC, as well as offering pathology consultative services for difficult lung and thoracic lesions to a variety of pathologists in the Nebraska area and surrounding states. Pathology diagnostic services in this section includes evaluation of lung cancers, interstitial lung diseases, pleural disorders, including mesothelioma, as well as mediastinal lesions. In addition to the evaluation of localized lung lesions, this section provides consultative services in lung pathology through the expertise of Dr. Ben Swanson and Dr. Michael Punsoni. 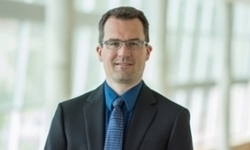 Dr. Swanson works closely with the thoracic section of the UNMC radiology department (Matthew Devries, M.D.) to provide important radiology-pathology correlation, which is necessary to appropriately classify the interstitial lung disorders. The pulmonary and thoracic section of the UNMC department also routinely interacts with the thoracic surgeons, pulmonologists, nurse specialists and radiologists at UNMC in the weekly multidisciplinary chest conference where cases of lung cancer and other difficult chest disorders are discussed in detail with experts from multiple disciplines to identify the best care for the patient. Benjamin J. Swanson, M.D., Ph.D.